ULMA C y E, S. Coop. The Mexico – Toluca Intercity Train was planned in order to connect the metropolitan areas of Toluca Valley and Mexico Valley, thus resolving longstanding transportation issues and traffic congestion. The project, with a total length of 58 kilometres, was divided into three main sections. The first section connects Zinacantepec Station with Portal Poniente. The second is a tunnel running underneath the Sierra de las Cruces Mountains, from Portal Poniente to Portal Oriente. The final section stretches from Portal Oriente to the Observatorio Station. The project was designed with 6 stations: Observatorio, Santa Fé, Lerma, Metepec/Airport, Bus Terminal, and Zinacantepec. The first section required 686 piers of one kind and 299 of another, all octagonal and with heights varying between 5 m and 17 m. Semi-moulds measuring 2.44 m and 0.61 m were created in the required shape, reaching a height of 6.10 m. This proved an economical solution, thanks to the versatility of the specialised formwork employed. For the hollow piers, the CR-250 climbing bracket system was used along with KSP platforms and ENKOFORM V-100. The piers, measuring up to 74 m in height, were completed in 3.6 m pours. Shoring height was varied throughout the section. 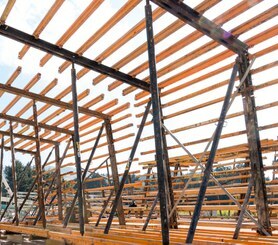 Full shoring was used as support, ENKOFORM to shape the piers, and a special formwork system composed of 2 frontal and 2 lateral metal panels was used for the pier caps. 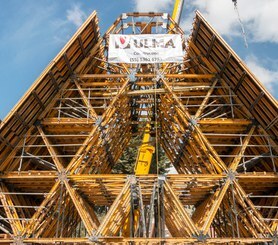 Multidirectional BRIO scaffolding was used to perform work at height, with stairways reaching up to 80 m above ground. Despite the size of this scaffolding structure it proved unnecessary to dismantle before moving. This drastically improved the efficiency of the pouring process, and allowed for constant adherence to the strictest safety standards. 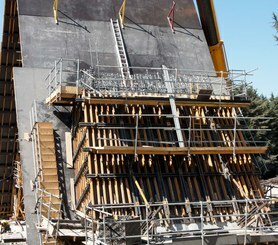 Crane-lifted climbing system optimised for large formwork gangs. Highlights: large working platforms and easy handling. A simple solution for supporting shaft internal formwork. Perfect for elevator and staircase shafts, hollow piers etc. 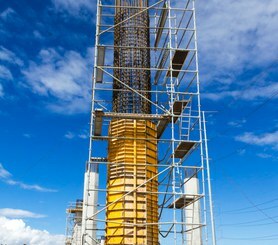 Maximum flexibility and adjustment for vertical structures in civil engineering and building construction. Excellent concrete finish. Extremely flexible and stable scaffolding system, it can be optimally adapted to any facade geometry quickly and in complete safety. Certified product. 2018 ULMA C y E, S.Coop. All rights reserved.